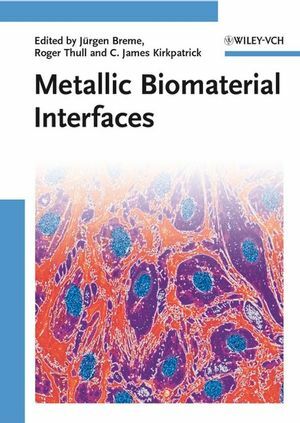 Clearly divided into three sections on the interface influence of materials and surface modifications, the physical and physicochemical surface characterization, and the biological characterization of the interface and biosystem reactions, this book is the first to concentrate on the highly important area of metal-based implants and their improved functionality and acceptance by the body. Jürgen Breme was the department head of Metallic Materials at the University of Saarland in Saarbrücken, Germany, until his retirement in October 2005. Having obtained his academic degrees from RWTH Aachen and University of Erlangen, he moved to Saarbrücken in 1988. He has authored over 200 scientific publications, including several books. His principal research interests are in the fields of titanium, titanium alloys and metallic biomaterials including composites, e.g. preparation and characterization of functional ceramic layers on implant materials. James Kirkpatrick holds the Chair in Pathology at the Johannes Gutenberg University in Mainz, Germany, and has three doctorate degrees from the Queen's University of Belfast, Ireland. he is a Fellow of the Royal College of Pathogists in London and Honorary Professor of two universities in China. He has worked at the universities in Ulm, Manchester and Aachen, is author of over 250 peer-reviewed articles and more than 700 scientific presentations. He is currently President of the European Society for Biomaterials and Associate Editor of Biomaterials and the Journal of Pathology. Roger Thull is physicist and Chair of Functional Medical and Dental Materials at Würzburg University, Germany. Before this, he spent 15 years in the Department of Medical Engineering of the University of Erlangen/ Nuremberg with R&D in different biomaterials engineering fields. His interdisciplinary work focuses on the science and research of biomaterials, design of sceletal implants, and testing of materials and medical devices. Since 1990 surface modifications (PVD, Sol-Gel) are being developed at the department as for polymer and metallic implants in the cardio-vascular, dental, and orthopaedic fields.